For anyone who prefers Mozart, Bach or Brahms more than electronic music of popular DJs, there are a lot of excellent classical music festivals to choose from. Moreover, while you’re there, you can also do some sightseeing, since most of the events are held in good holiday locations, which provide endless possibilities, beyond the music. Here are the best five festivals that you can’t miss the following months. An exciting summer festival of classical music, song, oratorio and opera, set in medieval hills between Nice & Aix-en-Provence, Musique Cordiale is one of the most significant music events in the area. Over 100 musicians pour into the village of Seillans to embark on two weeks of intense music making. 2016 will be the 12th edition of the festival and will feature over 18 concerts including major choral and orchestral works, chamber ensembles and late night recitals in churches, chapels or under the stars. The choral tradition remains the integral part of Musique Cordiale and a major work for choir closes the festival each year. Nonetheless, Musique Cordiale makes no charge for children aged 13 or under as long as they are accompanied by an adult, because they want to encourage young people to appreciate music. The first and only classical music festival organized at a marina, the festival hosted more than 3,800 artists and musicians on stage with 98 concerts during the last 11 years. The line-up of the festival this year includes great musicians and orchestras such as İdil Biret, Daniel Kharitonov, Lucienne Renaudin-Vary, Presidential Symphony Orchestra, London Chamber Orchestra, Bilkent Symphony Orchestra and Tonhalle-Orchestra Zurich. The organizers also have prepared lots of other activities: workshops for children – with classical music in the background -, cooking workshops, open-air movie screenings, story-telling, and an art exhibition in addition to concerts that begin in the morning and continue through the sunset. Moreover, by attenting the event you can also contribute to the well-being of those in need: all ticket income from the festival is donated to the Tohum Autism Foundation and Bodrum Health Foundation. 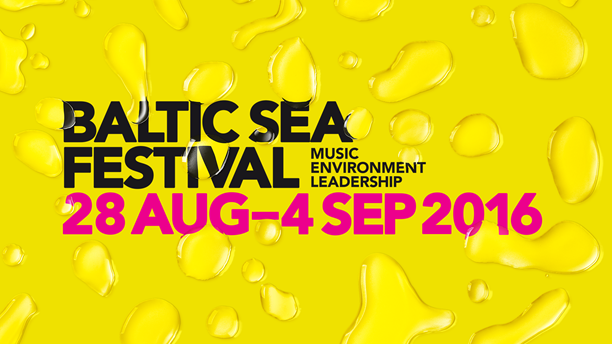 Baltic Sea Festival was founded in 2003 by Michael Tydén, former director of Berwaldhallen in Stockholm, Esa-Pekka Salonen, conductor and composer, Valery Gergiev, conductor and director of the Mariinsky Theatre in St. Petersburg. Over the years, audiences in Berwaldhallen has been invited to performances by, among others, the World Orchestra for Peace, Mariinsky Theatre Orchestra, West-Easter Divan Orchestra, Swedish Radio Symphony Orchestra, Swedish Radio Choir, and conducters Esa-Pekka Salonen, Valery Gergiev, Riccardo Muti, Daniel Barenboim, Daniel Harding, Peter Dijkstra. There has been several world premieres of new music in the festival. Famous orchestras, legendary conductors, and virtuoso soloists join together three times a year on the idyllic location of Lake Lucerne to celebrate the joy of music. 110,000 visitors annually visit Lucerne to experience one of the most exquisite and storied music festivals and to hear the international stars of classical music right in the heart of Switzerland. Along with cultivating the traditional repertoire, which is performed by leading international performers, Lucerne Festival is deeply committed to the realm of contemporary music: each year the work of one or two composers-in-residence is given a spotlight. Another cool thing at Lucerne Festival is that before the concert begins, you can reserve your drinks and snacks for intermission right at the KKL Luzern event hall. Approximately 2,000 artists appear during the Beethovenfest Bonn every year. This year, the concerts take place in 25 different locations in Bonn and its rural environment: concert halls, churches, museums, former parliament buildings, historical industry sights, modern office buildings and castles. The opening concert, which takes place at Beethovenhalle, is held by Hilary Hahn (Violine), Tschechische Philharmonie, Jiří Bělohlávek (Conductor), based on works by György Ligeti, Wolfgang Amadeus Mozart, Viktor Ullmann and Antonín Dvořák. The average ticket price is 40 Euros, but school and college students get a 50 % discount for all concerts. Badges. We all want these small items, because they are our gateway to the event. Backstage passes, VIP badges, press badges or regular entrance badges, we’ve all come across them, regardless of the event. Small and sometimes unnoticeable, badges are one of the most important elements that can make an event good or bad. And while a nice badge will make your attendees wear it with pride and keep it as a souvenir, a bad one can also help. It won’t stand out from the crowd but it will do the trick of getting you inside the venue for your event. So, badges are important for events, but can also be a big burden for the organizer. Ever wondered how it feels to manually create 100 badges for your event? Well, if you think it’s a pain… try to think about big events such as ICEEfest (3500+ badges) or even WebSummit (40.000+ badges), all of them personalized and separated in different categories. If you’re an event organizer, you know what we are talking about, but if you are just planning your first event, you are about to embark on a journey that could be easily called “the nightmare of badges”. Of course, there are some tips and tricks on how to overcome it. So you have your event planned, tickets are sold or you have several attendees registered. Now comes the badge part. Once someone comes to the event venue, he will be welcomed at the access point, where he will have his ticket checked and badge given. How do you make the badge attractive, so that people will wear it and use it during the event? When it comes to badges, size does matter J. 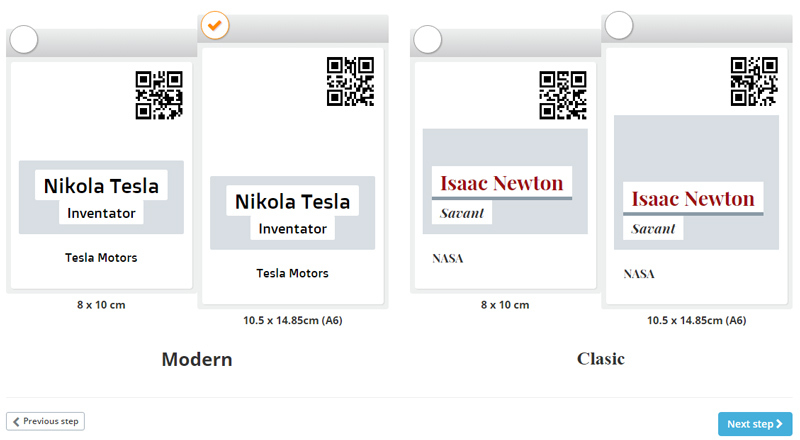 There are different regular badge sizes but generally, the standard sizes are: 8×10 cm and 10.5 x 14.85cm (A6). Basically you can do it any size you prefer, but it’s easier to follow the standards as usually the badge goes into a plastic pocket and unless you want to create a personalized pocket, you might want to go the traditional way. The badge has a limited space and you might want to select what information goes there. It is essential that it contains the First Name and Last Name of the attendee, preferably in that order. Then you might want to add important information, such as the name of the company that the attendee works for or his position in the company. You can add other information as well, but make sure that the text isn’t cluttered. A badge full of text will become unreadable and that is definitely not its purpose. A white badge is not a good badge – it will probably end up in the garbage bin at the end of the event. Badge design is vital for your event, as it reflects the whole image of the event. Besides the graphic elements that vary from one event to the other, you might want to take into consideration the badges for different categories at the event. The regular attendee badge should be different from the VIP badge or Press badge. 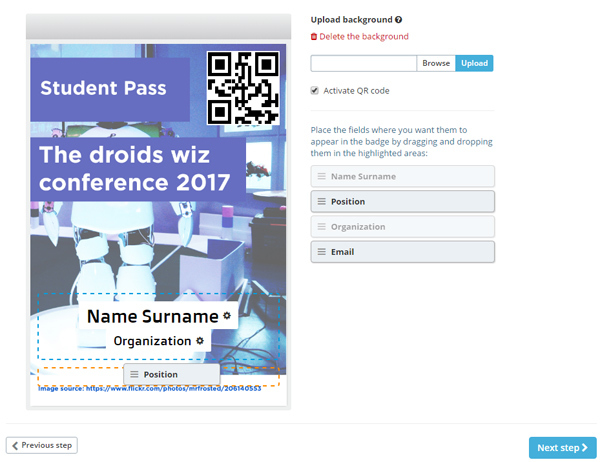 Also, a complex event can have different venues and different ticket options, so badges can help your organizing staff determine the identity of any attendee. To do this differentiation you can use various colors or designs. Your call. Yes, badges are the most attractive elements for the sponsors. Why? Because everyone gets a badge at the event and if your main sponsor is well positioned on the badge, everyone’s eyes will see the company’s logo. The badge “spot” is a precious one so you might want to consider a single sponsor to be positioned on the badge. That way you might get a good sponsorship just because you are playing the badge game correctly. Depending on your event, the badge might also prove useful for other things as well, not only access. For example, by unfolding the badge you might get the map of the event venue, the event schedule, or both. Thus, the badge can turn into your personal event assistant with just a couple of flips. As you’ve seen, badges can be a lot of things and can be a useful tool for your event. The most important thing, however, is that the badge can be a mirror of your event. If it’s done in a professional way, then there’s a good chance that your event will be professional. Spend time on your badge design and your event will benefit from it. Guaranteed! We also have a little secret regarding the time spent to defeat the “badge nightmare”. Time to unravel it: Go to Oveit.com, create an account and you’ll find our Badge design tool. Activate it and you can do thousands of personalized badges with just a couple of clicks. You don’t believe us? Give it a try and you’ll never want to use another badge design tool ever again. OK, so the band is doing well, you did some gigs in front of your family and friends and now you want to go to the next level. The best feedback you can get for your band is playing in front of a live audience, but that can prove to be more difficult to achieve without a label or a manager. However, in our times, when internet and social media are the best things that could ever happen to an aspiring music band, planning an indie concert can be a task easier than you might think. But remember… it might be easier, you might have all the right tools, but you’re still going to be putting a lot of effort into it. No pain, no gain. You can find anything you want on Google. The real key to using your new best friend is to know what you are looking for. According to Music Think Tank, there are a couple of interesting websites for indie artists that can help any aspiring musician learn a lot about industry, managers and booking shows, like Sonicbids Blog, Rap Rehab, Hypebot and, of course, Music Think Tank. 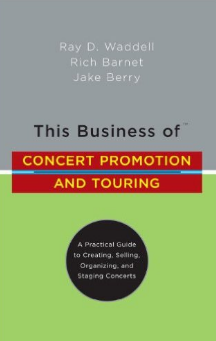 You might also want to check out some interesting books about concerts and tours. One of them is “This Business of Concert Promotion and Touring: “A Practical Guide to Creating, Selling, Organizing, and Staging Concerts” by Ray Waddell. A must-have for indie artists is: “All You Need to Know About the Music Business” by Donald S. Passman. This book is the definitive, essential guide to the music industry and is now in its eighth edition, revised and updated with crucial information on the industry’s major changes in response to rapid technological advances and economic uncertainty. Obviously, when you and your band don’t have big budgets to spend on marketing and promotion, social networks are the safest way to success. It might take some time but if you do it right, the results are guaranteed. Youtube, Facebook, Twitter and Instagram are names that you should be familiarized with, as they are key to a successful event and a growing popularity of your music. Singer Josh Levi claimed that “social media definitely plays a huge role in success today” and he is right. Either you are trying to promote your song or your concert, synchronize your accounts on every social network and start posting. You might bump into haters so keep calm and carry on posting… You might find out that a hater will only promote your music and some of his friends might actually enjoy it and come to see you play live. These are wise words from the music industry so you better take them seriously. You can’t have a concert if you don’t have songs. While singing covers will help you fill up the playlist, people will come to see your concert so if you want to be successful, you must have some personal creations. It takes just one good song to hit the charts and be successful but just like in any business, getting to number 1 is hard work and staying there is even harder. So it’s best you prepare a good and entertaining playlist for the people who come to see you. Now this is crucial. The selection of the venue can help you have a successful concert. Obviously you must select the venue that fits your target. If you want to organize a jazz concert, organizing the event at a Rock Club is definitely a bad idea. So, depending on what you sing, choose your venue wisely, as the venue itself can generate some audience. 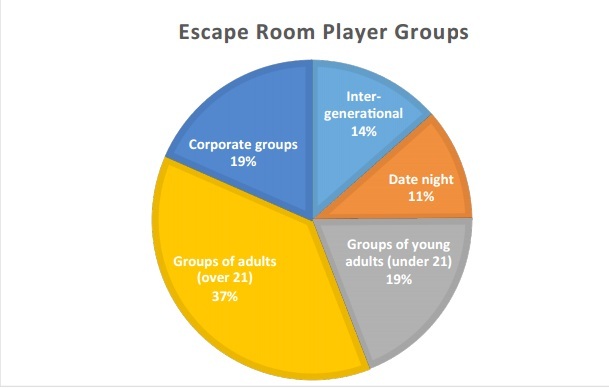 After all, it is in their interest also to get people to come inside and spend some money there. And since we’re talking about venues, make sure that the venue has the technical capacity for a proper concert. You might want to avoid places where the sound is bad or where people are cramming in and have no air to breathe. You managed to set everything in place. You have all social network accounts working and your website is up and running. You found the perfect venue for the concert and set the date now comes the crucial part: how to sell the tickets and generate some revenue? So what is there to do? Well, take matters into your own hands and sell your own tickets. It’s your show, your money, your time so why not sell your own tickets directly from your website? Once you advertise the concert on the social networks the people who are interested will come on your website and find more details about you, your band, your music and your events. Your website is the primary source of information for people who want to get to know you so why not sell tickets from your website. A few years ago, creating your own ticketing system was very expensive but now you have Oveit. With just a few clicks, you can set up your event in a couple of minutes and then use an Embed code to paste it on your website, and that’s it. You can now start selling tickets directly from your website. No more telephones to the ticketing platforms, everything you need is in your hands. So now you can focus on things that matter: the concert! It’s the evening of the concert. You sold your tickets and everything went as planned. People came to the venue, enjoyed your music and had a great time. What next? Transform your attendees into your fans. If you used Oveit to sell tickets, you might want to know that you have now gathered a lot of information about the participants. So now you have a data base to use and improve and you can send e-mails, make a newsletter and keep in contact with everyone. The key detail to being successful is communication. Music comes first but it doesn’t matter how good your music is if you lack interaction with your fans. Keeping them happy and satisfied will get you a long way. And now you can do that with your own data base. Back in the days, getting in contact with your audience was quite difficult. Now, this is not the case. Labels have discovered that organizing events themselves will improve their revenues. Why hire someone to do your concert when you can do it yourself? 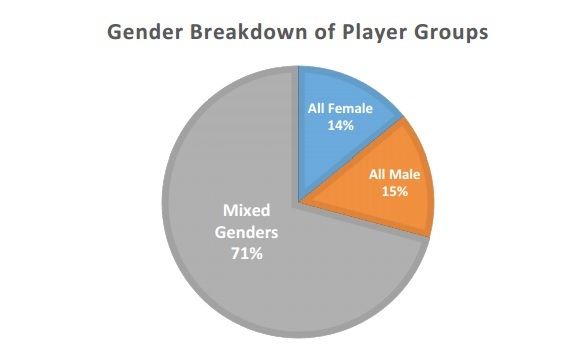 So if the labels do this, why couldn’t the indie artists do it?